March, 2001 Just a day after My Boy was born, his once-an-only-child sister is already asking, "Is this all this kid does?" So adorable! You can see it in her expression...that is exactly what she is thinking! What a great picture. Your caption is too funny, she looks bored with him in the picture, lol! I love those pics of the new baby with the equally new sibling! that is too funny! Look at them now! HAHAHA...bored with the kid already! That is a great picture! Loving the new Valentine Header! LOL...hilarious Jen. Love your daughter's curls! She looks so bored! I love it! Been there recently! Great picture! BWAAAAH! for the past two weeks I've been thinking about your post on K! I love it! Both kiddos are simply precious! how funny! The pic is adorable! That photo could be prophetical, Jen - to when they are teens. chkl. Looking in different directions, the boy knows only himself, and the girl muses about how different they are. what a precious moment and picture! That is cute! She really does not look impressed. Too cute and funny! That is how our older one felt...I think they are disappointed that the babies don't come out as instant play partners and require so much of Mommy's attention!! 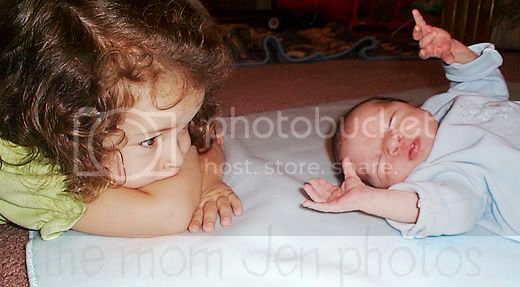 that's so sweet- my kids weren't into staring at the new babies, but my mom has pics of me doing that with my sister and brother- I love those pictures! Oh, she looks soooo bored! HAHA! I remember those days! Her forlorn expression is just too priceless! That is some seriously cute stuff, Jen. Little heartbreakers you have there, for sure. If I can get a good picture today, I'll come back and play. Got some sickies I'm taking care of though, so we'll see how *that* pans out, lol. my oldest thought the same thing about her new baby brother! The noisy squishy pink thing is what every one's so excited about?? how sweet, I thought it was K at first! Awh, my daughter did the same thing with my son this past summer! Thank you for letting me participate in A Thousand Words Thursday!! DQ looks exactly like K in this picture! I remember when Little pup starting crawling and crawled right over Big pup--BP was like "what just happened?!" Very cute picture! So sweet and innocent at that age. Can I go back? Pleeeease, just for one day! How cute!! Love the caption you came up with it's so fitting! Ha! Why don't you teach her how to change a diaper, then she'll realize what ELSE he does!! Awwww, I've got a picture just like this one. She still isn't too happy about her younger brother. HAHAHA! Love this picture! She looks totally bored with the new addition!! So cute! At first I thought that was K! I never realized that she and DQ look so much alike! If only we could keep them that small! Precious. Just wait!! She has no idea of what is to come! That is very sweet, I just had mt 3rd child 4 weeks ago and my 20 month old is having the same sentiments as your daughter! Is that all this kid does? I am still laughing, I would have said, no, careful it poops too. such a cute picture! i love it! WOW -- that picture looks so much like K! I remember when there was only 10 of us on A Thousand Word Thursday's! How exciting at how many there are now! What a wonderful picture....I remember my daughter having the same moment with her new brother! Hmmmm now what is this creature Mom has put here? 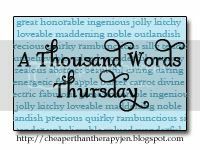 This is my first time participating in A Thousand Words Thursday! I love your pic, it's so cute. They look about the same age split as my two kids! I was thinking the same re: all ATWT joiners! You have such a large following! You blog rock Jen! BTW, love the picture. Sass is still bored with her siblings. Her curls are so sweet. I love how DQ's just sitting there watching him. I always knew that's what they were really thinking. DQ looks a lot like K in this picture. Is she about the same age K is now or a little younger? Awwww, look at those two little ones! How sweet. I love looking back like that. Beautiful picture of your little ones.lol. I remember that question..I miss it when they were that small. Wow! That is quite similar to mine! Must be so confusing for kids to have a new person come in their lives like that.